When was the last time you downloaded a binary file from the Internet or grabbed one off of a network share that is used by your organization to store commonly used software? Did you verify the hash of that binary with the hash supplied by the official software distributors? If not then you could very easily be in a world of hurt. Today we are going to be talking about a piece of software by Joshua Pitts (@midnite_runr) called “Backdoor Factory” (BDF for short) that patches malicious payloads into binaries in a way that makes it trivial to bypass Anti-Virus, retains full binary functionality, and does not increase the file size by a single byte. How is BDF different from other tools such as MSFVenom? Tools like MSFVenom have the ability to patch a malicious code into legitimate binaries by appending the malicious code to the end. The problem with this is that it not only increases file size of the backdoored binary but it is also easier for Antivirus engines to pick up on this. BDF makes it much easier for attackers to hide malware in binaries by utilizing code caves. Code caves are products of code compilers. There are certain times where a code compiler will have to pad certain areas of the binary and it does so by padding with a whole series of 0x00 bytes. Those are known as code caves and BDF overwrites those code caves with malicious code. Because you are utilizing null space already present in a binary, you will not see a change in file size when using BDF. For the remainder of this blog post, I will be using the latest version (3.0.3 from Github) located at /opt/the-backdoor-factory. Once we have BDF, you can look at all the command line options by using “-h”. You will see tons of command line options. The main ones we are going to be concerned about today are the following flags. -s SHELL, --shell=SHELL  Payloads that are available for use. -H HOST, --hostip=HOST  IP of the C2 for reverse connections. -J, --cave_jumping    Select this options if you want to use code cave jumping to further hide your shellcode in the binary. 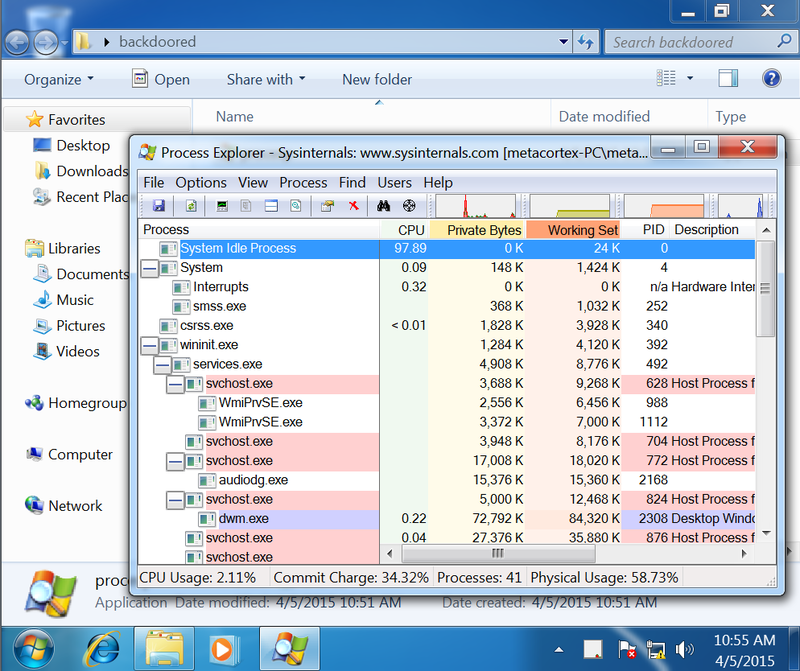 Lets go ahead and test this out by backdooring a well known program such as Process Explorer from the SysInternals suite. I have downloaded a copy of it and run some hash algorithms on it so we can verify that it has in fact changed. First thing we want to do with BDF is see what kind of things it can patch into procexp.exe natively. We do this by using the –f flag and the –s flag. Perfect, we have 9 different shell codes that we can use. Lets go ahead and use “iat_reverse_tcp_stager_threaded” using the -s flag. This shell code will utilize the Import Address Table of the binary to patch in Metasploit reverse TCP stager; it will also be threaded. This payload also utilizes two additional flags, the -H for IP and -P for the port that the tcp stager will connect back to. _   _____/____    _____/  |_  ___________ ___.__. As you can see from the above output, we were able to select what code cave we wanted to store the shellcode in (#5), patch the shellcode into the procexp.exe binary using the selected code cave, and verified that the size has not increased and the hashes have changed. At this point we are going to want to fire up msfconsole and start up the multihandler listener. Now we need to distribute the binary to our victim and get them to run it. 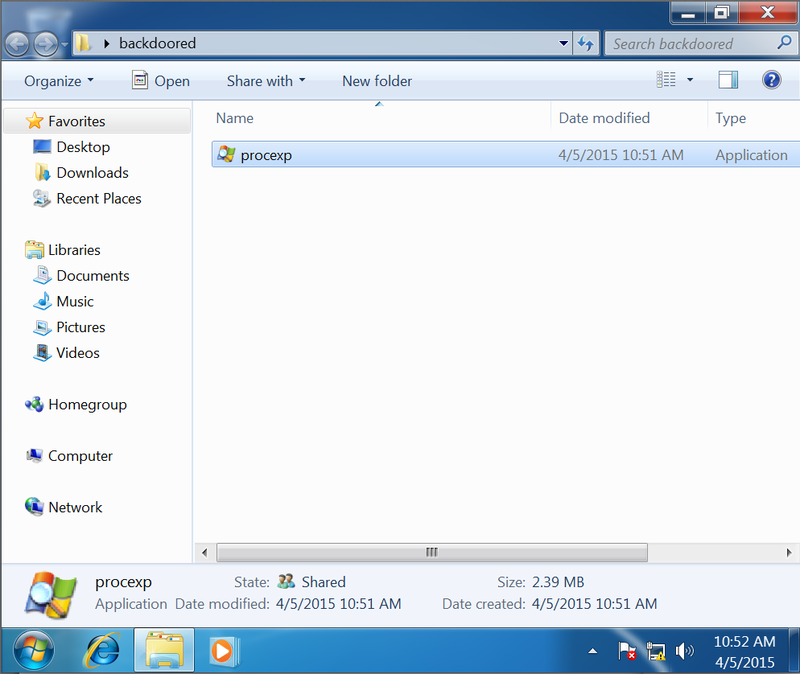 Since we are in a lab environment for the purpose of this blog post, I will transfer it to a Windows VM. We can see the backdoored binary in the screenshot below. Once we run it, we will see the standard Process Explorer that most of us are familiar with. Great, so we now that we have a meterpreter shell, we can continue to do a whole number of evil things such as migrate to other processes, escalate privileges, and start attacking other hosts on the network but how does this fair against anti-virus detection? A quick upload to Metascan detects that 2 out of 44 scanning engines have detected this binary. And likewise, uploading the backdoored procexp.exe to VirusTotal, we discover a detection rate of 1 out of 57. BDF has some additional options that are very handy to use. First of all, you can do cave jumping with the -J flag. This will divide the shell code between 3 separate code caves. While I have not seen the use of -J significantly influence Anti-Virus scanning results, it will obfuscate the shellcode more than using a single cave. BDF has also recently added the -m flag where you can specify the patching method. While BDF will default to patching a binary manually, you can use the flag -m automatic and Backdoor factory will automatically select the best code caves to use without any further user interaction as seen below. So remember, whenever you are downloading binary files that you are going to run, don’t solely rely on AntiVirus to flag it. You need to also verify that the hash of the file is a known good hash provided by the software distributor. Danny Howerton is a Senior Security Consultant with Secure Ideas. If you are in need of a penetration test or other security consulting services you can contact him at dhowerton@secureideas.com, on Twitter @metacortex, or visit the Secure Ideas – ProfessionallyEvil site for services provided.